Anticipation for the newest Star Wars movie is over the moon despite two disappointing prequels, so the decision to release a game with exclusive footage isn't so much shrewd as it is inevitable. This isn't the blatant middle finger that Enter the Matrix was, but it still leaves too much daylight between what it is and what it should've been. So young Anakin is on a journey to the dark side, is he? I think we all know how this one ends. Without spoiling anything, suffice it to say that hopefully the finished film is more convincing. The beautifully-shot cut-scenes feel awkward and out of place, and the universally lousy voice-over delivery could grate cheese. 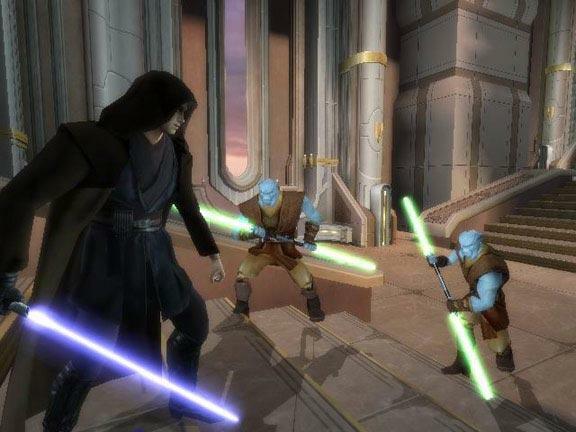 Anakin and Obi-Wan start with a limited set of techniques, but an advancement system allows each to expand his repertoire with flashier and more powerful maneuvers. Experience is gained by hitting enemies while minimizing your own damage. So far so good. Trouble arrives when you actually use those earned feats in combat. Unless you're into old-school button-mashing, the single most important aspect of any beat-'em-up is the sense of control, and is found wanting. More often than not you'll be trying to block while your character stubbornly insists on finishing his follow-through. You're far less vulnerable when you're tapping out quick attacks, so most of the time all those fancy moves just go to waste. The sense of forced repetition this yields rubs the wrong way, especially since total playing time is on the short side. As if all this wasn't enough to hurt immersion, cut-scenes often interrupt attacks then deposit you wherever they think you should be. There are other nasty issues dragging the fun factor down. Sometimes your too-similar enemies, or even your AI partner, will just stop and stare off into space for a few moments, and all you need to do to get yourself a moment to "force heal" is hide on the opposite side of an object. One would think this sort of primitive path finding wouldn't be too difficult, especially when the levels themselves, while born of settings rich in potential, are mostly of the bland corridor-room-corridor variety. You'll find arbitrary boundaries that enemies can walk and shoot through. Often you can't even see those enemies: the static, often too-close camera won't let you. While the cool attack animations do a lot to salvage the visuals, you'll still see more detail in the background space-fights than you will in the halls you wander. Worst of all is the repetitive and completely linear feel of every mission. Ray shields are placed with no purpose other than to make you find yet another set of power cables to sever, and any sense of puzzle-solving is killed when the game itself tells you absolutely every move you need to make. Revenge of the Sith can be simple-minded fun if you don't expect much from it, especially if you've got someone to play the cooperative mode with, but it's far from the "ultimate Jedi action experience" the box claims it is.